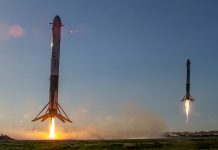 Following a second tethered hop test of the company’s Starhopper test vehicle, SpaceX founder and CEO Elon Musk released dramatic footage of the rocket hitting and struggling against its tethered limits. 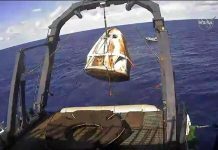 SpaceX conducted the first tethered hop test of a prototype of the company’s Starship heavy-lift rocket on April 4. After the completion of this first test, Musk retweeted footage captured by an onlooker from some distance away but did not release any official footage. This second time around though, the mercurial CEO released a two-second tease of the latest test. The second test of the Starhopper vehicle was conducted on Friday, April 5. By examining the footage just before the Raptor engine is ignited, the tethers holding the Starhopper vehicle down can clearly be seen attached to the inside of each of its three legs. Then, once the engine is ignited, you can see the vehicle lurch upward before jerking against the tethers. The clip then cuts out seemingly before the test is complete. 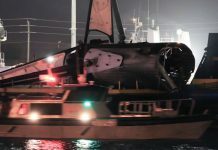 Apparent from the short clip, Musk did not release any additional information regarding the duration of the test, the outcome of the test, or when the next test is expected and what it will aim to achieve.